YoungBloodZ are an American Southern rap duo from Atlanta, Georgia, comprising members J-Bo (born Jeffrey Ray Grigsby on October 4, 1977) and Sean P (formerly known as Sean Paul, but changed his name to avoid confusion with the Jamaican reggae dancehall artist of the same name) (born Sean Paul Joseph on March 7, 1979). The two met at Decatur's Miller Grove Middle School, where they started the Attic Crew with some friends. 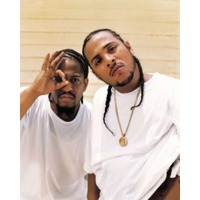 They are signed to LaFace Records and are best known for singles such as "U-Way" (1999) and "85" (2000), featuring Big Boi of OutKast and Chris Streng. After a three year absence, they returned with "Cadillac Pimpin'", scoring a moderate hit. However, the duo achieved a major hit with "Damn!" produced by Lil Jon, which reached No. 4 on the Billboard Hot 100 and has been their only (solo) Top 10 hit to date. Two years later, they returned with "Datz Me" featuring Young Buck, a then member of G-Unit and another Lil' Jon produced hit "Presidential". They released their second single, "Chop Chop", from their third album, Ev'rybody Know Me, which was produced by Scott Storch. The YoungBloodZ song "I'mma Shine" was featured in the 2006 movie Step Up and in its soundtrack. The soundtrack reached number one on the US Billboard Top Soundtracks in 2006. Sean P has made numerous appearances in hit singles including Cherish's "Do It to It", Sammie's "You Should Be My Girl", and Lil Jon's "Snap Yo Fingers" with E-40. He is currently working on a solo project under Cornerstore Entertainment/Asylum/WMG that is scheduled for release sometime in the near future. The first official single is entitled "I'm a Hoodstar" and was produced by CP Hollywood.